In December, among the lots in the Important 20th-Century Design auction at Wright in Chicago is a house to put them in. Four and a half years ago, Mark Haddawy, an owner of the Resurrection vintage boutiques, purchased Pierre Koenig’s Case Study House No. 21 (above) in Los Angeles, sight unseen. Now, after essentially curating this 1,320-square-foot steel-and-glass house — filling it with rare designer furniture, including pieces by Poul Kjaerholm and Craig Ellwood — Haddawy is moving on. But instead of contacting a real estate agent, he approached Richard Wright, the owner of the auction house, which specializes in 20th-century art and design. “I thought the house was really better presented as a work of art than as a conventional house,” Haddawy says. The opening bid for this icon of California Modernism is $2.5 million, almost twice what a similar property by an unknown would fetch in the area. 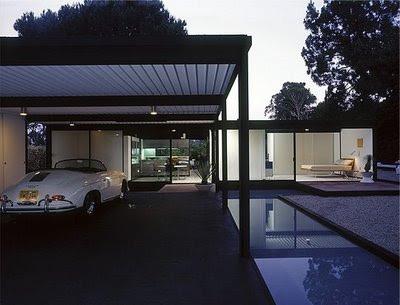 Nearly all of the contents of the house — the furniture, most of the art, even the 1958 Porsche roadster in the carport — will be sold as separate lots. “It’s a big step for us,” Wright says, noting that this is one of the few works of significant modern architecture to be sold by a fine-art auction house (like the Farnsworth House, by Mies van der Rohe, and the Rockefeller Guest House, by Philip Johnson). To honor the event, Wright enlisted Julius Shulman, the Case Study program’s original photographer, to shoot a photo essay for the catalog. He also commissioned artists like Catherine Opie and Todd Hido to create a series of images there. “It’s such a nice way to say goodbye,” Haddawy says. “It kind of makes it easier.” Surely the 1956 John Lautner house that he’s moving into with his girlfriend, the actress Nora Zehetner, will also help ease the pain.